Stipe Miocic still wants his rematch against UFC heavyweight champion Daniel Cormier. 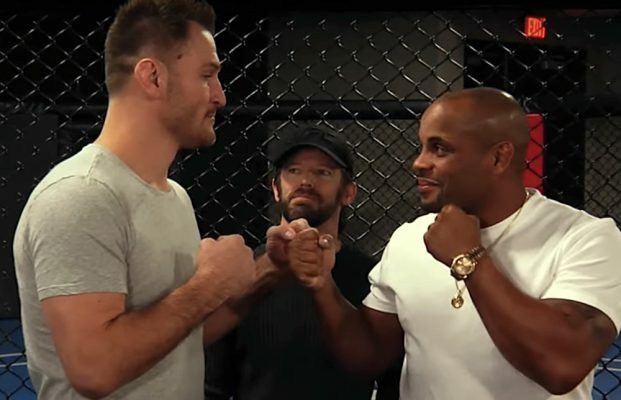 It’s been six months since Cormier stunned Miocic with a first round knockout when they met at UFC 226 last July that made the former Olympian the first person in UFC history to simultaneously hold the heavyweight and light heavyweight titles. Immediately after the fight was finished, Miocic asked for a rematch and considering he was the longest reigning heavyweight champion in UFC history, it seemed like a reasonable request. Unfortunately, Cormier ended up accepting a short notice title defense this past November against Derrick Lewis and has lately been pursuing a fight against current WWE champion Brock Lesnar, who is reportedly planning a return to the UFC in 2019. Meanwhile, Cormier has long said that he wanted to retire by the time his 40 th birthday rolled around and that deadline comes due in March. Now more recently, Cormier has cast doubt on that exact date for his retirement due to lingering injuries that could prevent him from competing as early as March but he still sees an end date in mind when examining his career. That’s why Miocic is once again calling for Cormier to take the fight with him rather than sitting and waiting for Lesnar or taking on anybody else before his career is finished. “March 20 is coming up quick. Let’s settle this and get this fight on the books before you blow the candles out on that cake,” Miocic said when addressing Cormier on Twitter. Cormier has said that if the Lesnar fight gets delayed too far into the future that he would absolutely grant Miocic a rematch after his long reign as champion. The UFC has attempted to book Miocic into fights since his loss to Cormier last July but the Ohio native has maintained that he deserves a shot to redeem himself after more title defenses than anybody else in the history of the division. It remains to be seen if the UFC will ultimately grant Miocic his wish or if he will be forced to sit on the sidelines in hopes that he will eventually get another shot at Cormier and the title.